In the next few years, another 2 billion people will be coming online; transforming the Internet from what once was an elite network of the world’s privileged to a democratizer of information and power. This wave of new users will mainly enter the Internet via mobile phones on social networks. Of course Facebook feels dominant today – there are now more people on Facebook than the total number of people online in 2004. 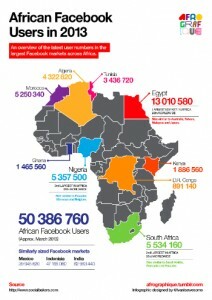 And there are more Facebook users in Bangkok or Jakarta than London. Facebook’s success is followed closely by Twitter, which is (rightly) seen as a whole different kind of social media. 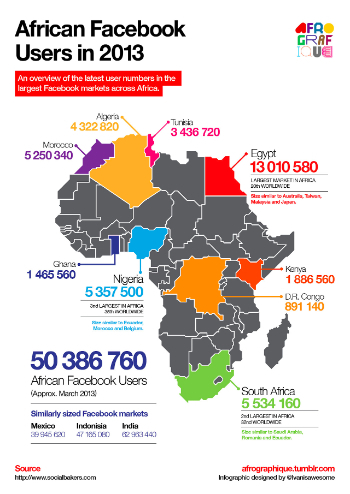 Just check out these African tweet maps. Regardless of these two or whatever comes next, social media has a reach only behind radio and TV in electronically touching people’s lives. More powerfully than radio or TV, social media allows you to interact directly with your constituents, breaking down hierarchical barriers. The interaction is not with the marketing department, but often directly with the decision maker, bypassing existing power structures and control processes. So if social media has this great reach, how can we implement and manage a social media strategy in international development programs to effect real world actions and long-term behavioral change? That was the challenge we tackled at the Social Media Technology Salon in Washington, DC, with Jessica Dheere, Social Media Exchange, and Jim Rosenberg, World Bank. Subscribe to get invited to future Salons in London, Nairobi, New York City, San Francisco, and Washington, DC. 2. You may need a Social Media policy. When constituents and staff can directly communicate everyone feels empowered. Still, social media has its own culture – fast, funny, snarky – that may not fit with corporate culture. You may need to make sure people understand that work/personal boundaries fade with social media and act accordingly. But there is hope! If the World Bank can figure out how to co-exist with its staff on social media, so can you. 3. Be aware of social media limitations in society. There are many positions and profits that exist due to specialized, unshared knowledge, which is counter to the social media culture of sharing everything, always. Those that benefit from unshared knowledge can be strong roadblocks to social media adoption and impact. 4. Do not build your own social media platform. Smartphone apps are so yesterday – the iPhone is 5 years old and everyone has an unused app already. Instead, go where your constituents already are. Your first step should be to find where they are already are talking and listen. Then adapt your efforts to their existing and near-future social norms and focus on driving participation first and foremost. That’s not broadcasting – its 2-way communications with constituents as equals. A quick and easy way to start is to launch a Facebook Group (assuming that in step 1, you found your constituents on Facebook). People know how to use it, its ubiquitous, and can help you judge demand for your conversation for a relatively low entrance fee – your time. 5. Quantity does not equal quality. What does 10,000 Twitter followers or Facebook likes mean for engagement? Where does social media engagement transfer into real-world action and behavior change, and not just click-activism? Be careful not to oversell social media using witchcraft metrics or Twitter bot Astroturf. 6. Treat social media as another engagement tool. Social media is okay on its own, but its so much stronger when combined with radio and TV, which still have much greater reach. Also both are more established as purveyors of “truth” or at least are seen as more generally reliable that social media. You can reinforce messages on all three and use social media to create the buzz that attracts radio and TV and their air of legitimacy.